Money in the Garage: Boxes Rule! Upon arriving back home at my Bat Cave, I discovered the Nintendo box was empty. But it still contained the two-piece styrofoam packing that protects the system. In this business you must adapt to your conditions, so I quickly retrieved a Nintendo system I had socked aside. I paid a mere $3.00 for it without the box. So I matched the system with my garbage picked box and created a "complete" system. I posted it on Ebay and it sold in it's "new" box for $49. This was a lot more money then I would have earned without a box! Some additional hints on selling game systems; the more games you can include with the system, the more bids you will receive. Also, if you don’t have the system but do have the box, there is a market for the empty boxes. Many “gamers” and those Used Game stores are always looking for boxes to make a complete set and re-sell. 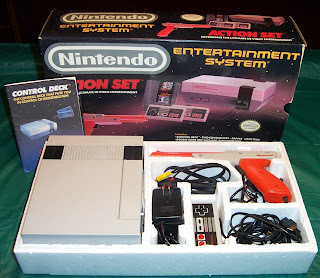 Lastly, if you buy a new game system for the kids, DON'T throw the box away-save it for when you re-sell the system. What if you just have a bunch of games - Do you think you're better off hanging on to them and finding a system to sell them with? I would hold on to them and wait until you pick up a system to sell with them. It makes it much more attractive to a buyer. Thanks for the comment/question! I have a complete system, over 20 games but no box. Is that worth anything?